combustion efficiency returns substantial cost savings. Steam and hot water use is prevalent throughout industrial processes. Production of these two media is most commonly accomplished with a boiler, many of which are heated by combustion of fossil fuel. 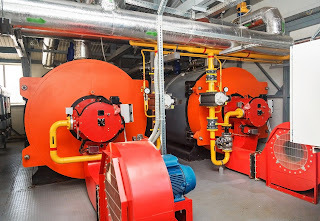 Fuel fired boilers of a certain size become the focus of regulatory requirements for emissions. All boilers consume what would be construed by their owners as large amounts of costly fuel. Because of their high pressure and temperature, and the presence of a controlled combustion within an occupied facility, safety is a paramount concern. Fireye® is a leading manufacturer of flame safeguard controls and burner management systems for commercial and industrial applications throughout the world. Their products, the first of which was developed in the 1930's, enhance the safety and efficiency of all fuel fired burners. Precise fuel air ratio attained using parallel control of servos to regulate fuel and air supplies. Glance through just the first two pages of the document below to get a full description of the capability of this compact and comprehensive controller. You can get more detailed information, or get a professional evaluation of your current system efficiency, by contacting the application experts at Classic Controls. Fuel Air Ratio Controller for Combustion Efficiency from Classic Controls, Inc.